Apply to NDSL NDS GBM GBASP GBA console. US Version. Reproduction Unit. 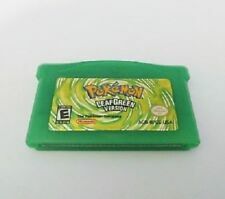 Pokemon Leaf Green LeafGreen Version GBA Gameboy Advance Reproduction. Condition is Brand New. Shipped with USPS First Class Package. Pokemon Sapphire GBA Nintendo GameBoy Advance Authentic Tested/working. Internal clock battery has run dry- the game can be played and saved but time based events do not occur. Condition is Very Good. Shipped with USPS First Class Package. Pokemon Fire Red Version GBA Gameboy Advance Gameboy Reproduction SHIPS FROM USA. Condition is Brand New. Shipped with USPS First Class Package. Pokemon: LeafGreen Version (GBA) is in excellent condition and is tested for pla yability. Prepare for another breathtaking Pokemon gaming story. Your brother will then convince you to join Team Rocket and the story goes on until you eventually lead team rocket. Don’t need to trade to evolve any Pokemon. For instance berry bushes will not grow. Can I get proves?. Video will open in a new window. 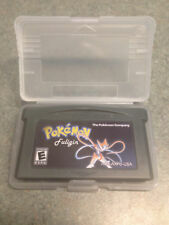 Pokemon: Ruby Version (GBA) is in excellent condition and is tested for pla yability. Once again, the picture displayed is of the actual item you will receive - nothing more, nothing less. If not paid for by the 7th, the item will be relisted. Item - Up for sale is the item exactly as shown in the picture(s). Pokemon AUTHENTIC & TESTED Fire Red Gameboy Advance (Game Only). Condition is good Shipped with USPS First Class Package. Authentic, both work! One per sale. 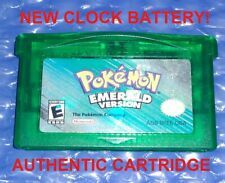 ORIGINAL AUTHENTIC Pokemon LEAF GREEN Version Gameboy Advance. Used. Sold as is. Condition is listed as good due to marker writting on back. Shipped with USPS First Class Package. Pokemon Ruby Version GBA Gameboy Advance Gameboy Reproduction SHIPS FROM USA. Condition is Brand New. Shipped with USPS First Class Package. The pictures were updated at 5:30pm on 4/12 to show the cartridges currently available. You will receive ONE of the cartridges pictured. It is guaranteed to be an authentic Pokemon Sapphire. I installed a new battery, and I verified that it does work. -the casing has a internal fracture/crack by the screw (see pics), but the casing still holds up well Check out my other listings/store for many more great deals! 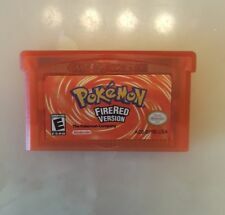 ORIGINAL AUTHENTIC Pokemon Fire Red Version Gameboy Advance. Condition is Very Good. Shipped with USPS First Class Package. You must close this portal before its too late. Together with other friends, our hero will prevent the heat of the legendary Pokemon by the actions of Team Magma and Aqua. What will help Groudon and Kyogre calm down?. 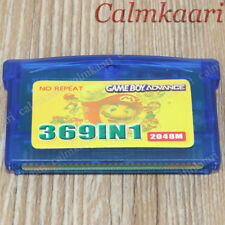 The pictures were updated at 5:35pm on 4/12 to show the cartridge currently available. It is guaranteed to be an authentic Pokemon Sapphire. I installed a new battery, and I verified that it does work. -the back casing has an internal fracture/crack (see pics), but the casing still holds up well Check out my other listings/store for many more great deals! Brand new. Repro cart. Ships fast! Any questions please message me! Will be shipped fast safe and secure. The professor’s grandson turned evil and has taken over the Pokemon Headquarters. It's your job to stop him along with his eight subordinates, which are genetically modified tyrant Pokemon. The Story : You are a poor boy living in a small town but with an ultimate dream of becoming the best Pokemon trainer. Authentic, cartridge only copy of Pokemon: Sapphire for Nintendo GameBoy Advance. Cartridge and label are both in very good condition. Free shipping! POKEMON Ruby VERSION for GBA/GBM/SP/NDS/NDSL. Works and saves great! DO NOT HESITATE TO BUY FROM US. Original Pokemon Sapphire GBA Nintendo GameBoy Advance Authentic. Condition is Very Good. Shipped with USPS First Class Package. Gameboy Advance E Reader W/ Manuals And Pokemon E Reader Cards CLEANED + TESTED!